It all started so well – sun beaming down on Newcastle Main Street, clear views of Donard as we lined up for the start. As we exited the forest, still fine weather and no hint of what was to come. Up the Black Stairs, very wet underfoot and lack of fitness means that I’m well back. Five minutes after exiting the Black Stairs route, the wind really starts to pick up. Out onto the open mountain and the snow arrives. Have to stop, lie down to get my waterproof jacket on due to the wind. Snow stops but wind really picks up, hood up all the way to the ‘start of the stones’. Just below the little cairn, the wind ups to gale force, we are being blown about all over the mountain. Have to stop occasionally to hold on. Then the hailstones arrive, hitting bare legs like shotgun pellets. Delve into the bum bag and lie down on the ground to get my waterproof trousers on. Weather so bad, decide to lie there for a while. A glance around me shows all the other runners doing the same, one runner curled up in a ball in the shelter of the little cairn. Hopes of making the top in under an hour have long ago evaporated. Temperature drops dramatically. After 5 minutes decide the weather’s not improving and as the nearest shelter is the Mourne Wall at the top, get up on my feet and head for the summit. Other runners are starting to do the same. Gale force winds on the summit pushing all runners to the left hand side of the summit – so cold, hands tucked into arm pits to try and keep warm. 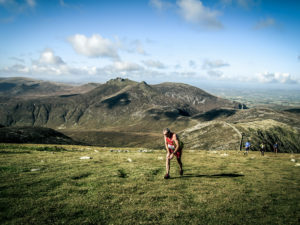 Marshals indicating that they want runners to go around the summit cairn anti-clockwise. No chance, the gale force winds making it possible to go only one way. The girl in front of me had her 2 foot long hair in a pony tail, which was sticking straight out 90 degrees to her head due to the wind. Eventually reach the shelter of the wall at the summit, blown to bits and frozen. Can’t speak to the marshals to give them my number as my face is frozen and mouth not working (hurrah you say), hands frozen solid. Joined by other runners in the lee of the wall, all desperately trying to warm up. Stand there for 5 minutes, gradually getting warmer and working out which is the best (quickest!) way down. Marshals are directing people down the wall, which doesn’t appeal to me at all as it’s straight into the howling gale and hail. Eventually decide on the black stairs route and head off at a good pace out of the shelter of the wall. Lean into the wind and it’s a lot easier than going up. Half way down the hail stops and wind eases – at the top of the Black Stairs another stop to stuff the waterproofs back into the bumbag as I’m overheating. Run down Newcastle Main Street in sunshine. Was I just dreaming that I had experienced the worst conditions in my twenty years of mountain running? As I’m so far back in the field there is only cold water in the showers. Believe it or not it’s tolerable! Off to the pub, where all the fast runners were complaining about the snow I experienced at the top of the Black Stairs. They missed the hail and wind. Order a pint of stout, thoroughly enjoy it.